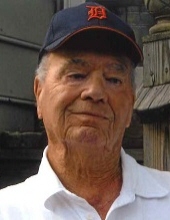 Francis Clark Maples, age 94, of Lugoff, South Carolina, formerly of Imlay City, died Monday, November 5, 2018. He was born in Detroit, MI, the son of the late Ira Joseph and Margaret Joy (Sutherland) Maples. Mr. Maples served in the 1st Army Company B 746th Tank Battalion in the European theater from 1944–1945, where he earned the Purple Heart. He later worked as a safety officer at Lapeer State Home in Michigan. Mr. Maples is survived by his children Gary Francis Maples (Nina) of Menan, ID, Charlene Ryan (William) of Lapeer, MI, and Francis W. Maples (Elizabeth) of Blythewood; six grandchildren and eleven great-grandchildren. Besides his parents, Mr. Maples is predeceased by his first wife and mother of his children, Shirley Emma Hill Maples; his second wife Dorothy Nesbitt Maples; brothers, Joseph, Charles, and Donald Maples, and his sister, June Martin. A service to celebrate the life of Francis Clark Maples will be held at 11:00 AM on Saturday, December 1, 2018 at Muir Brothers Funeral Home in Lapeer, MI. The family will receive friends one hour prior to the service from 10-11AM. Military honors under the auspices of American Legion Post #16 Honor Guard will follow immediately after the service, at the funeral home. Memorials may be made to AMMIGO (Medical Mission in Global Outreach) at www.ammigo.org, or by mail to 718 Westchester, Grosse Pointe Park, MI 48230. Please share condolences and memories at www.MuirBrothersLapeer.com. Arrangements by Muir Brothers Funeral Home, 1021 S. Lapeer Rd., Lapeer, MI 48446. "Email Address" would like to share the life celebration of Francis Clark Maples. Click on the "link" to go to share a favorite memory or leave a condolence message for the family.